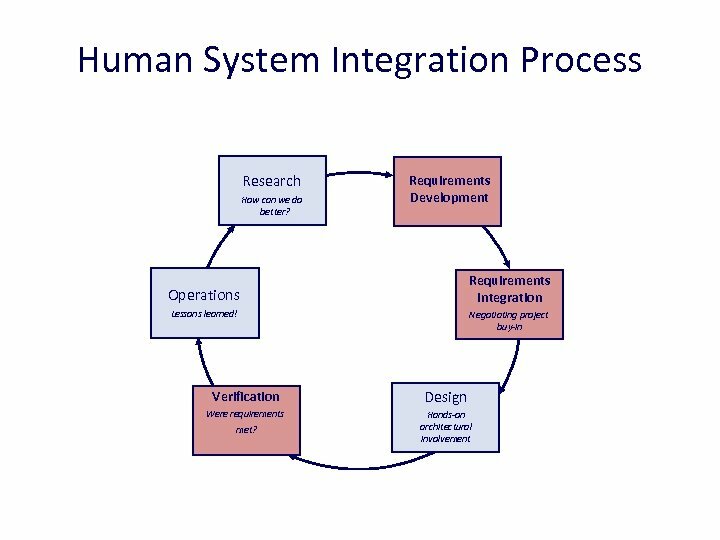 Human System Integration Process Research How can we do better? Requirements Development Requirements Integration Operations Lessons learned! Negotiating project buy-in Verification Design Were requirements Hands-on architectural involvement met? 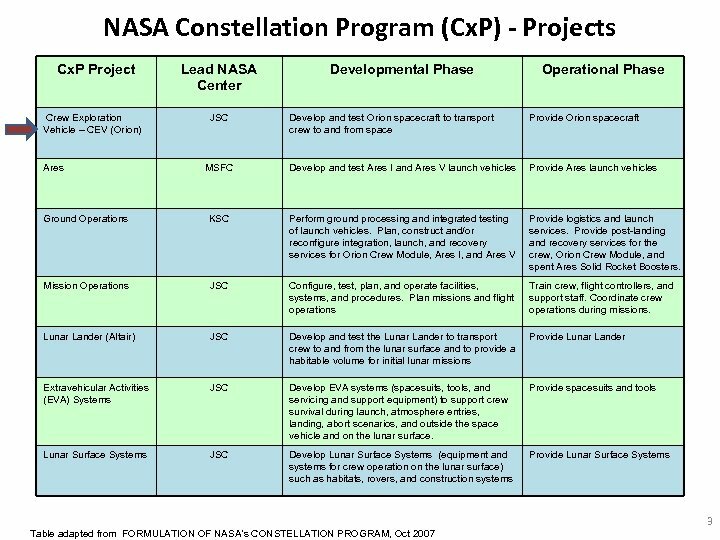 HSI in NASA’s Constellation Program (Cx. P) via Human Rating Requirements - NPR 8705. 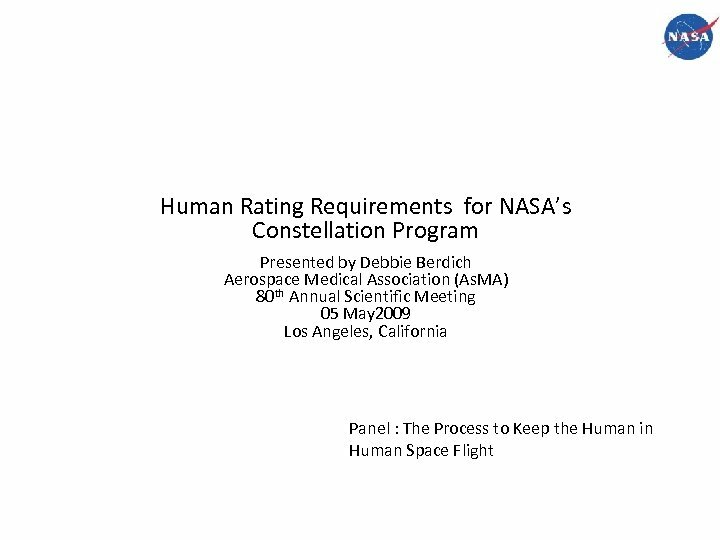 2 B • The purpose of NASA Procedural Requirements (NPR) 8705. 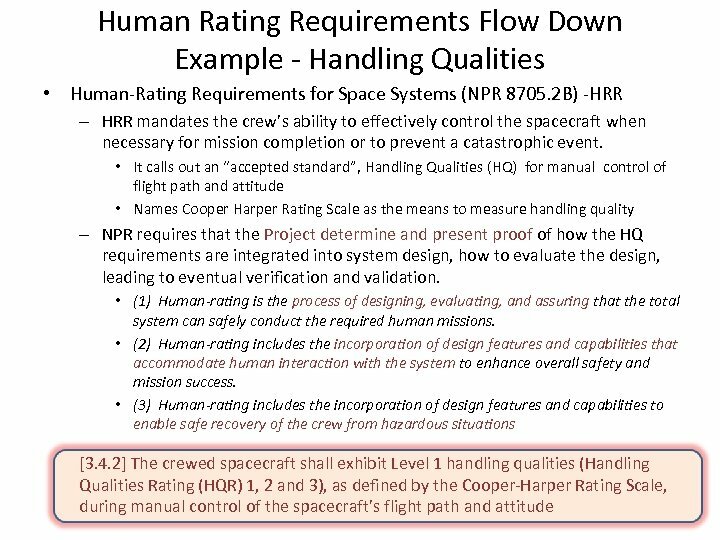 2 B, Human Rating Requirements (HRR) document, is to define and implement the additional processes, procedures, and requirements necessary to produce human-rated space systems that protect the safety of crew members and passengers on NASA space missions. • A human-rated system accommodates human needs, effectively utilizes human capabilities, controls hazards and manages safety risk associated with human spaceflight, and provides, to the maximum extent practical, the capability to safely recover the crew from hazardous situations. • Human-rating is an integral part of all program activities throughout the life cycle of the system, including design and development; test and verification; program management and control; flight readiness certification; mission operations; sustaining engineering; maintenance/upgrades; and disposal. The NPR is not levied directly on any of the Projects. Instead, Cx. P generates requirements which will meet the intent of the NPR and then flows those down to the Projects via allocation matrices. 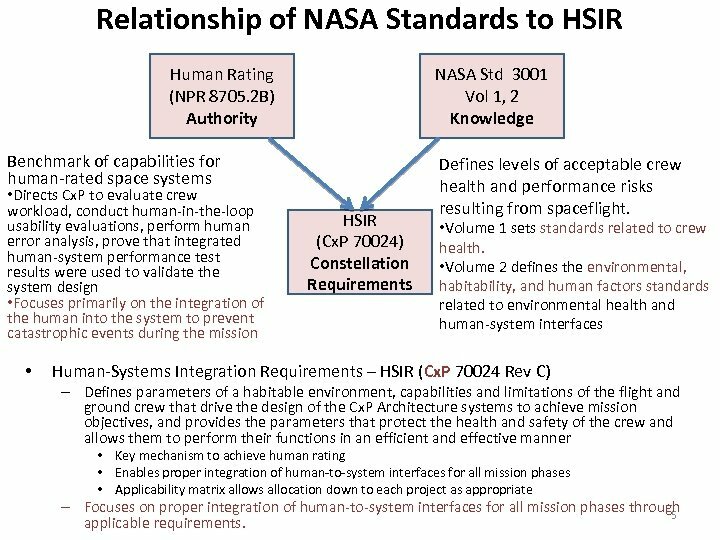 Relationship of NASA Standards to HSIR Human Rating (NPR 8705. 2 B) Authority NASA Std 3001 Vol 1, 2 Knowledge Benchmark of capabilities for human-rated space systems • Directs Cx. P to evaluate crew workload, conduct human-in-the-loop usability evaluations, perform human error analysis, prove that integrated human-system performance test results were used to validate the system design • Focuses primarily on the integration of the human into the system to prevent catastrophic events during the mission • HSIR (Cx. 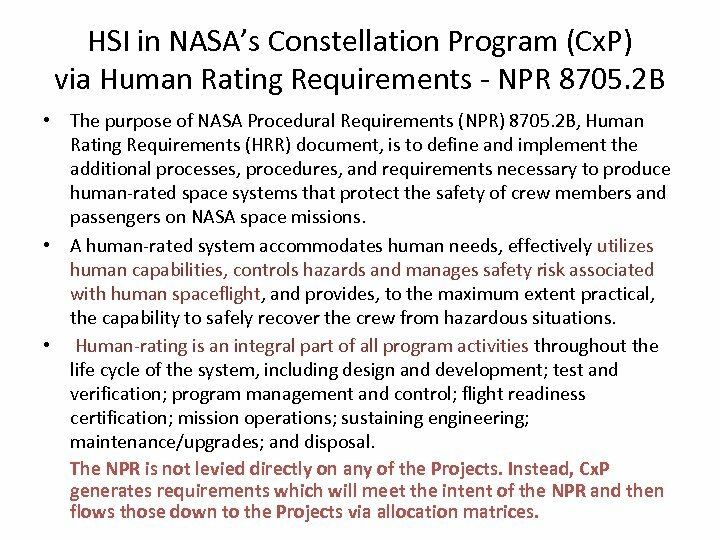 P 70024) Constellation Requirements Defines levels of acceptable crew health and performance risks resulting from spaceflight. • Volume 1 sets standards related to crew health. • Volume 2 defines the environmental, habitability, and human factors standards related to environmental health and human-system interfaces Human-Systems Integration Requirements – HSIR (Cx. P 70024 Rev C) – Defines parameters of a habitable environment, capabilities and limitations of the flight and ground crew that drive the design of the Cx. P Architecture systems to achieve mission objectives, and provides the parameters that protect the health and safety of the crew and allows them to perform their functions in an efficient and effective manner • Key mechanism to achieve human rating • Enables proper integration of human-to-system interfaces for all mission phases • Applicability matrix allows allocation down to each project as appropriate – Focuses on proper integration of human-to-system interfaces for all mission phases through 5 applicable requirements. 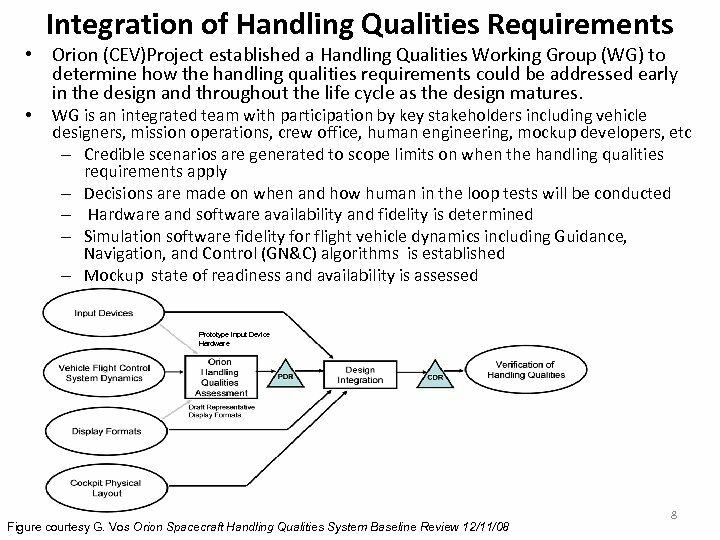 Tracing Requirements - Human Rating to HSIR In the Example of Handling Qualities • Human Systems Integration Requirements (HSIR) Cx. 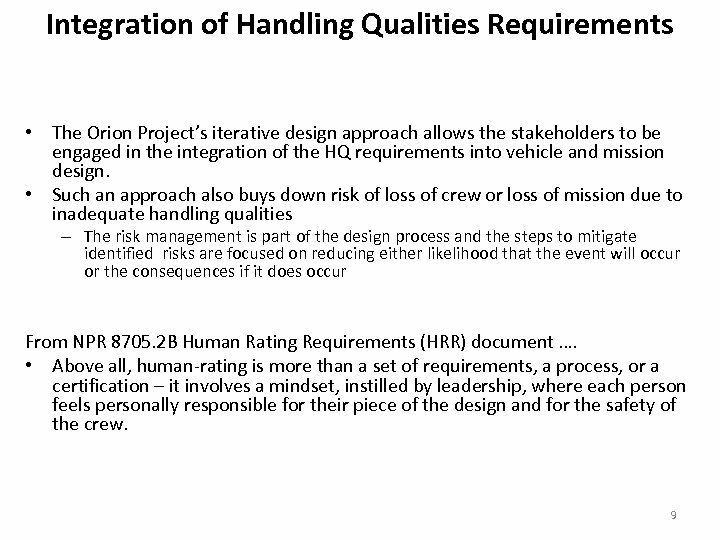 P 70024 Rev C – HSIR has two requirements for Handling Qualities – allocated to Orion (CEV) and Altair (Lunar Lander) • One requirement for Loss of crew or vehicle; One for Loss of mission • Verification specified as analysis and test – Task based and via Cooper Harper Rating Scale [HS 7003] The system shall have handling quality ratings of 1 or 2 on the Cooper-Harper Scale for tasks that can result in loss of crew or loss of vehicle. [HS 7003 V] The crew-safety handling quality rating shall be verified by analysis and test. The analysis (task analysis) shall identify the list of tasks in which errors can result in loss of crew or loss of vehicle. The test shall consist of at least 5 crew trained as operators performing the listed control tasks in a flight-like simulator or mockup and providing handling-quality ratings on the Cooper-Harper scale. The verification shall be considered successful when the analysis with test shows that, for all tasks that could result in crew or vehicle loss, no individual Cooper-Harper rating exceeds 2. [HS 7004] The system shall have handling quality ratings of 1, 2 or 3 on the Cooper Harper Scale for tasks that can result in loss of mission. [HS 7004 V] The mission-safety handling quality rating shall be verified by analysis and test. The analysis (task analysis) shall identify the list of tasks in which errors can result in loss of mission. The test shall consist of at least 5 crew trained as operators performing the listed control tasks in a flight-like simulator or mockup and providing handling-quality ratings on the Cooper-Harper scale. 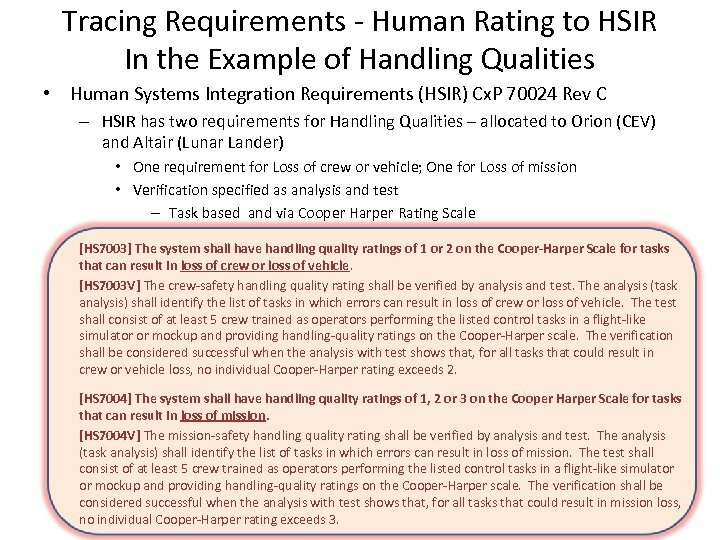 The verification shall be considered successful when the analysis with test shows that, for all tasks that could result in mission loss, no individual Cooper-Harper rating exceeds 3.